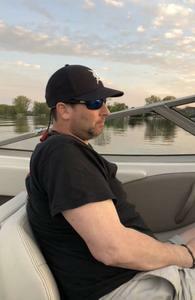 James Raymond LeZotte, of Vicksburg passed away on Sunday, July 8, 2018 at the age of 46. Jim was born on May 23, 1972 and was the son of Martha and Raymond LeZotte. Jim is described by those who loved him as a very kind, honorable person, and had a great sense of humor. In his spare time he enjoyed fishing, following sports, video gaming, and he loved his two cats. He was a 1990 graduate of Vicksburg High School and then he went on to receive his Bachelor’s of Business Administration from Western Michigan University. Jim is survived by his parents: Martha and Raymond LeZotte, of Vicksburg; his sister Karen (Steve) Raffenaud, of Portage; niece and nephew, Addison and Evan Raffenaud and several aunts and uncles. Please visit Jim’s webpage at www.mccowensecord.com where you can read his obituary, sign the guestbook and share a memory. The family is being assisted by the McCowen & Secord Family Funeral Homes, Rupert-Durham Chapel, 409 S. Main Street, Vicksburg (269-649-1697).